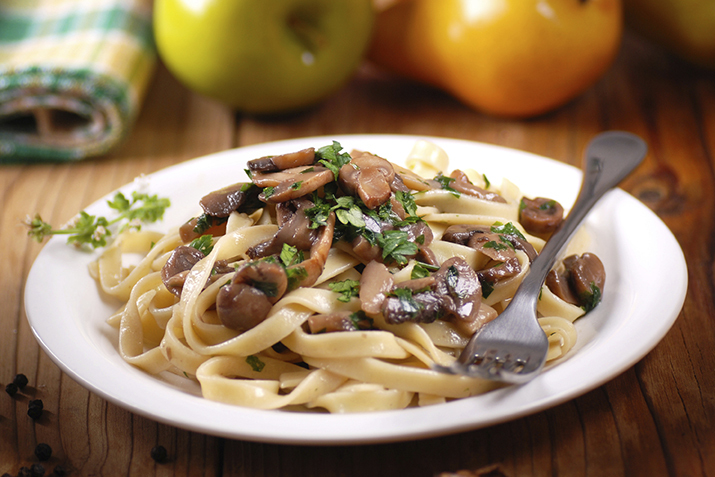 This mushroom ragout makes a delicious side, topping for grilled meats or poultry, or as a substitute for gravies. If using dried mushrooms, soak them in water overnight. Drain the soaked mushrooms and chop into bite-sized pieces. Heat the oil in a large wok or saucepan. Add the shallots and garlic and sauté for a few minutes. Add the mushrooms and toss gently. Cook the mushrooms until tender, about 8 minutes. Add the sherry, parsley, salt, and pepper. Cook for another 5 minutes, or until mushrooms are soft and sherry is absorbed. Garnish with pine nuts and serve with buttered noodles, or heap a few tablespoons of the mushrooms on top of grilled meats or poultry.